Just a reminder that early bird registration for SOA’s 2018 Annual Meeting ends on Monday, April 30th! That will also be the last day to register for the 50th Anniversary Mixer, which will be held Thursday, May 17 from 6-8pm at Polaris Grill. Join us to celebrate 50 years of SOA! Please join us for the Society of Ohio Archivists’ Annual Meeting Thursday May 17-Friday, May 18, 2018 at the Quest Conference Center, 8405 Pulsar Place, Columbus, Ohio, 43240. See conference page at http://www.ohioarchivists.org/annual_conference/ for more. Plenary speaker Tanya Zanish-Belcher, president, the Society of American Archivists, and director of Special Collections & University Archivist at Wake Forest University, will discuss several key components of an archival career, including the role of mentoring and networking, keeping up with trends in archives, and why belonging to professional associations is important. Printable form: download this PDF, and mail to Mark Bloom, Treasurer, 8477 Summer Road, Macedonia, OH 44056. The meeting registration fee includes continental breakfast, lunch, and breaks (including cake!) on Friday. Due to catering restrictions, lunch cannot be guaranteed for those who register onsite. Early bird meeting registration (ends April 30, 5 PM): $45 SOA members, $65 nonmembers, $30 students. Regular meeting preregistration (May 1–May 11, 5 PM): $50 SOA members, $70 nonmembers, $35 students. Onsite meeting registration (May 18): $60 SOA members, $80 nonmembers, $40 students. Workshop preregistration (ends May 11, 5 PM): $20 for members of SOA/ALAO, $25 for nonmembers, and $10 for students. No onsite registration available for workshop. Limited to 40. Mixer registration (ends April 30, 5pm): $20. SOA has reserved a block of rooms at the Fairfield Inn & Suites Columbus Polaris, which is right next to both the Polaris Grill and Quest Conference Center. The rooms will be available at a discounted rate of $119 a night. Book by April 18, 2018. To reserve a room in the block, use this link, or call 614-568-0770 and mention that you are with the Society of Ohio Archivists. Our 50th Anniversary Mixer will be an excellent opportunity to talk with old buddies and colleagues, and to make new friends among your SOA peers over heavy hors d’oeuvres and beverages. Also available will be a cash bar. The mixer will be limited to 50 attendees, and registration will close when early bird registration ends on April 30, or when the event is full. Remember the early bird gets the worm! This entry was posted in SOA Spring Conference on April 26, 2018 by Andrew Harris. The Society of Ohio Archivists is Celebrating its 50th Anniversary! Beginning February 27, the Society of Ohio Archivists will celebrate a half-century of service to Ohio archival repositories and archivists. To mark the occasion, we will be highlighting the accomplishments of our organization throughout the course of the year. 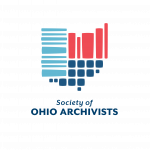 Stay tuned to the SOA website, social media and upcoming issues of the Ohio Archivist for more information on forthcoming activities and ways to engage with SOA. 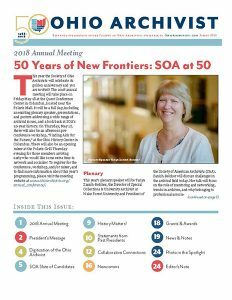 If you want to share your favorite SOA or Ohio archival memory over the coming year, be sure to tag the SOA twitter handle @ohioarchivists and use the hashtag #SOAat50. This entry was posted in SOA Spring Conference on February 27, 2018 by Andrew Harris. Location: Quest Business and Conference Center, 8405 Pulsar Place, Columbus, OH 43240. Deadline to submit proposals EXTENDED: Friday, January 19, 2018, 5 p.m. The SOA 2018 Program Committee seeks a broad array of creative proposals, sessions and posters, related to archival work today and into the future. All proposal topics are welcome. Panel Sessions – Two to four speakers present on a common theme. Poster Presentations – Report in which information is summarized using brief written statements and graphic materials, such as photographs, charts, graphs, and/or diagrams mounted on poster board. Presenters will be assigned a specific time at which they must be with their poster to discuss it with attendees. Debate – Moderator announces the topic, and two other people debate. May include more than one topic and additional debaters. Fishbowl – Speakers sit in a circle of chairs on stage — the bowl—and the audience sits in concentric circles around them. The speakers are then asked to talk to each other by answering a series of directed questions. In an open fishbowl, one chair is left empty and audience members can rotate through, adding their take on the topic. Lightning – Presentations may be from 3 to 10 minutes long, with the time allotted depending on the number of presenters. May or may not include slides or images. Mini-Workshop – session teaching a skill or concept through hands-on activity. Pecha Kucha – Each presentation consists of 20 slides or images displayed for 20 seconds each, with comment. Each presentation lasts 6 minutes and 40 seconds. World Café – consists of multiple presentations/conversations going on at separate tables, with attendees given the opportunity to rotate between them every 20 minutes. All sessions will have an assigned member of the Program Committee to provide introductions, and, as needed, to moderate. Proposals will be evaluated on clarity, originality, diversity of content and speaker representation, and completeness of proposal and presenters. We encourage proposals from students*, new professionals*, first time presenters and attendees, as well as individuals from related professions, including those from outside of Ohio. This entry was posted in Meetings, SOA Spring Conference on December 6, 2017 by Andrew Harris. To be held at the Quest Business and Conference Center, 8405 Pulsar Place, Columbus, OH 43240. The Program Committee encourages proposals of panel sessions, student and professional posters, as well as alternative formats such as debate, fish bowl, lightning, mini-workshop, pecha kucha, world café, and other session formats that encourage interaction between presenters and attendees. This entry was posted in SOA Spring Conference on December 8, 2016 by Andrew Harris. Congratulations to our newly elected treasurer, Mark Bloom and council members, Ron Davidson and Sasha Griffin. Our thanks to outgoing Treasurer, Emily Gainer, and council members Andrew Harris and Suzanne Reller for all of their hard work and dedication to SOA. This entry was posted in SOA Council, SOA Spring Conference on May 31, 2016 by Andrew Harris. On-site registration*: $60 / SOA members, $80 / non-members, $40 / students. *Please note: Lunch is not guaranteed for on-site registrants. Theme: Knocking down walls and reaching out: Archives in your community. Plenary speaker: Mandy Altimus Pond, Archivist for the Massillon Museum. Other highlights: Exciting presentations, poster session and networking opportunities, silent auction, SOA business meeting, and much more! This entry was posted in SOA Spring Conference on May 16, 2016 by Andrew Harris.